Melissa Partyka is deploying a mulit-probe to collect water quality parameters in agricultural tailwater ponds. Agricultural recovery basins are an important conservation practice designed to provide temporary storage of sediment and water on farms before low-volume discharge. However, food safety concerns have been raised regarding redistribution of captured sediment and water to fields used for human food production. The purpose of this study was to examine the potential microbiological risk that recovery basins may contribute to nearby produce fields and to evaluate characteristics that may influence or mitigate those risks. 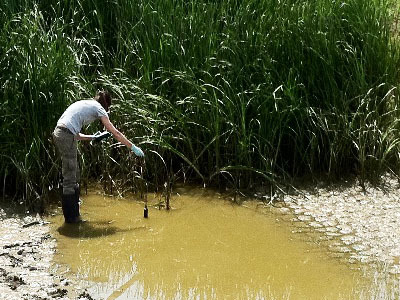 Water and sediment samples were collected from participating farms in three states and evaluated for bacterial indicators and pathogens over several months. Overall, 45% (n = 48) of water samples and less than 15% (n = 13) of sediment samples were positive for Salmonella spp. In water samples, the occurrence of Salmonella was positively associated with the use of surface water as a source of irrigation compared with groundwater as well as log-scale increases in Escherichia coli concentration. In sediment samples, Salmonella was associated with basin location (region) and basin fill levels. Sediment exposed to drying during dewatering had lower concentrations of indicator E. coli and a lower proportion of Salmonella positives than submerged sediment from the same pond. Surrounding landscape characteristics, including vegetative coverage, proximity to livestock operations, and evidence of wildlife, were not correlated with pathogen occurrence in either sediment or water samples, suggesting that although habitat surrounding ponds may be an attractant to wildlife, those features may not contribute to increased pathogen occurrence in agricultural recovery basins. Partyka, M. L., R. F. Bond, J. A. Chase, L. Kiger, and E. R. Atwill. 2016. Multistate evaluation of microbial water and sediment quality from agricultural recovery basins. Journal of Environmental Quality 45:p. 657-665.